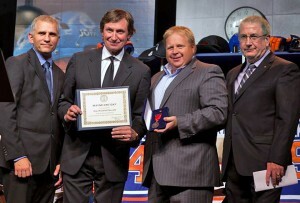 Wayne Gretzky was awarded an HRF at the First Annual Kinsmen of Edmonton Legends Experience dinner. The award was presented by Curtis Kimpton, president of the Kin Canada Foundation, and Dale Cooper, president of the Kinsmen Club of Edmonton. “Tonight it is my distinct privilege and honour to announce the presentation of this award to our guest, star attraction, hockey, community and country icon… the person whose integrity, community spirit, community support and national pride continue to inspire Canadians of all ages,” said Doug Ingersoll, past national president of Kin Canada. Nicknamed “The Great One,” he is generally regarded as the best player in the history of the NHL. His hockey jersey number 99 was retired by all teams in the NHL. In his career with the NHL, Gretzky smashed almost every record on the books. He scored 894 goals eclipsing Gordie Howe’s previous record of 801. He won the Art Ross Trophy for most goals scored in a season ten times, seven of them in consecutive years. He led the Edmonton Oilers to four Stanley Cup wins and helped Team Canada win gold at the 1987 winter Olympics. At 18 years of age he was awarded the Hart Memorial Trophy as the NHL’s most valuable player and received the same honour eight more times throughout his career. Gretzky was awarded the Lady Byng Memorial Trophy five times. This trophy is awarded annually to the NHL player judged to have exhibited the best type of sportsmanship and gentlemanly conduct combined with a high standard of playing ability. Gretzky was named an officer of the Order of Canada on June 25, 1984, for outstanding contribution to the sport of hockey. It took 13 years and seven months and two Governors General before he could accept the honour because the ceremonies are held during hockey season.